Logic is simple: whenever I call grantAccess(...) method an address (passed as an method argument) has to be added to mapping with "true" value. The problem is that this simple code does not work. After I send a transaction to execute grantAccess("0x.....") method, I call isAuthorized("0x....) method and it always returns "false". I've tried it with Chrome extension called "Sol" and with .NET Etherum API. The result is always same: isAuthorized(...) contract method returns "false" no matter what I do. I think the problem is in passing string as an address argument but I have another contract where I do a similar thing and it works just fine. Did somebody experience similar issues? Another update on this problem: when I took latest browser-solidity sources and used it instead of "Sol" Chrome extension, I was able to see correct results. So, I suspect "Sol" extension has a bug in response decodding code and has to be updated. Unfortunately C# API wrapper (Nethereum) continues returning wrong results. 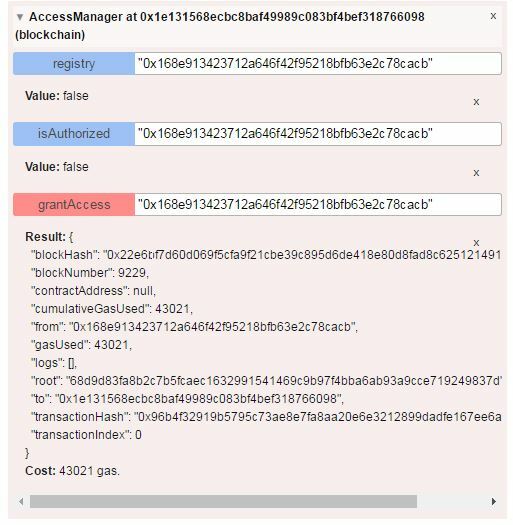 I was able to grant access to an account throught C# code and verify that blockchain contains correct results using browser-solidity. OK, now I found why Netherum (C# API) did not work: I copy-pasted code that calls a contract method from another place and forgot to remove "gas" parameter (in original code "gas" is required). But as "isAuthorized" method is constant, it does not require any gas for its execution. Normally I would have to get an exception but I didn't, instead I was receiving "false" (default value) all the time. hi usarskyy, i am facing a similar problem. it would be great if you share the code snippet of nethereum code callasync or dto method.